To the ‘easy’ I should add versatile for this next recipe. I first made them spread on parchement paper on a sheet pan in our land oven. 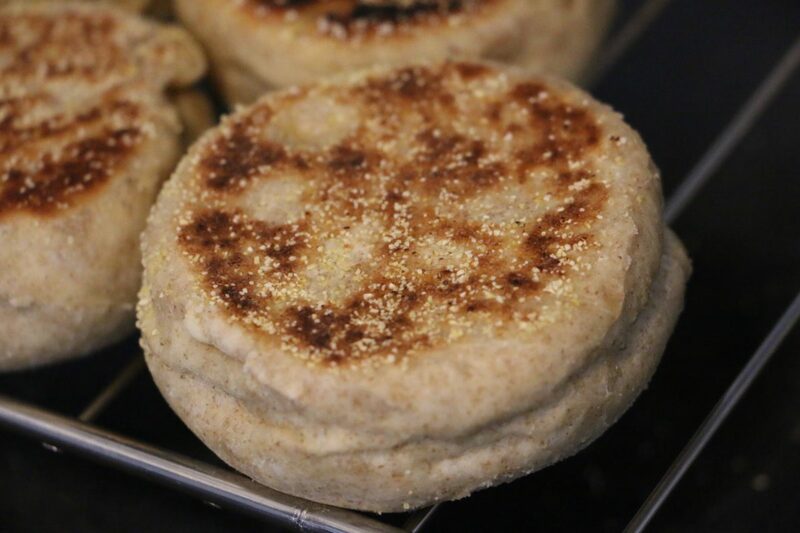 Using a cookie cutter made them the perfect size to top a toasted English muffin. As I now believe almost anything cooked in a conventional oven is possible in the Omnia Stove Top oven, why couldn’t these? So I tried. And I succeeded. 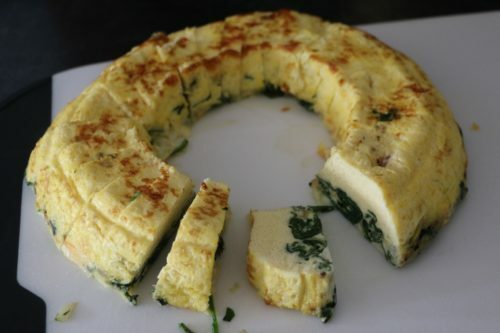 Perfect little fritatta like eggs all on their own but as a sandwich they are transported to an easy take-away-on-the-go breakfast. Fits so well with Francois’ boat safety mantra: ‘one hand for the boat, one hand for yourself’ (or your yummy breakfast sandwich). Or for you RV folks: ‘one hand on the wheel one for your easy breakfast sandwich’. I’ve used them with English muffins and lately nestled between some freshly baked biscuits (my easy recipe for these here) which I cut into squares before baking. Better shape for the egglets and less waste. Speaking of waste, don’t toss the extra bits. They make really good filling for a breakfast quesadilla. Just pile them on tortillas, sprinkle with cheese (some jalapeños if you’re feeling spicy), top with another tortilla and grill on both sides till browned and melty. You’re welcome. You can make these ahead (three to four days in the refrigerator or they freeze nicely too) and reheat when ready to use. This is where the Omnia comes in handy yet again. 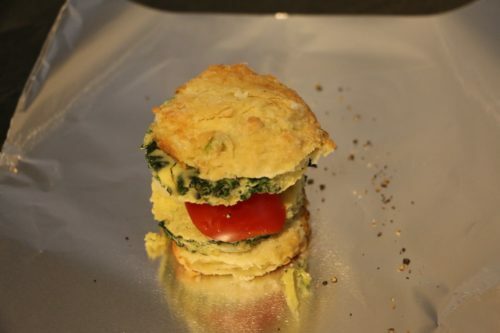 Wrap each sandwich in foil, place on the baking rack. Cover and place on heated base, medium low for about 10 minutes should be enough to heat them through. 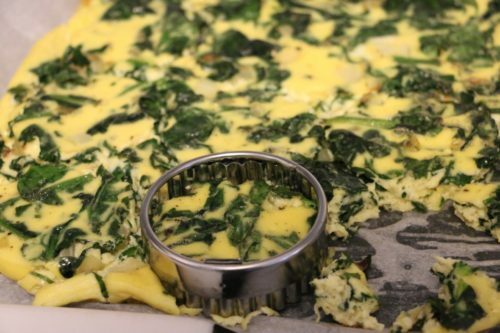 Spread onion and spinach evenly around a well greased Omnia baking pan or on a parchment lined baking sheet if using conventional oven method. Pour evening over onion and spinach. Cover Omnia and plate on pre-heated base and cooked on high for 5 minutes. Reduce heat to medium low and continue to cook for another 15-20 minutes or until egg is set. In conventional 350 ° oven cook for 15-30 minutes until set. If adding other veggies like chopped mushrooms or peppers, I would suggest sauteing them first to lose some of the liquid, them cooling before adding.